Improve your personal style with a brand new three-quarter sleeve top designed by Chemistry. Style this black piece with distressed denims and trainers when you have errands to run. 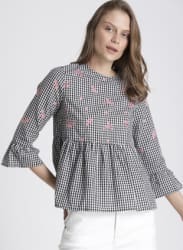 Black and white checked woven regular top, has a round neck, three-quarter bell sleeves, button closure.